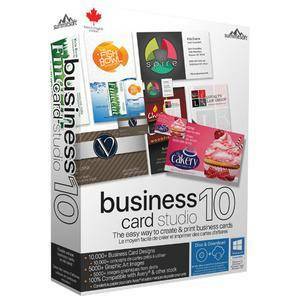 Business Card Studio Deluxe - Create a professional business card in 3 easy steps. It only takes a few steps to create a great looking business card: 1) Choose It: Select your card style from 10,000+ pre-made designs or create your own from scratch. 2) Change It: Personalize your selected card with your own information, change out graphics, and add new text, images and logos. 3) Print It: Easy at home printing or send your design to a professional printer. You will find professionally designed pre-made cards perfect for you – no matter what industry, profession, service or product! And all of the added tools allow you to create the perfect unique card for you. Only Business Card Studio has Auto-Design Card Wizard for unlimited professional concepts. In today’s business, image is everything. Let Business Card Studio create elegant business cards for you. Choose an business card template and utilize the layout editor to change the position of the name, address, and other info. You can also change colors, alignment, background, logo, and much more. You can completely customize the look and feel of your business cards, easily. Don’t know where to start? Business Card Studio 10 combines the revolutionary ACG (Auto Concept Generator) and 3D Text Studio, giving you design options never before available in any business card software. After you input your name, title, business name, and other data, ACG generates and unlimited number of business card variations. Over 1000 incredible fonts perfect for business cards and 5000+ graphic art images will make your card stand out among the others. Business Card Studio allows you to create vertical, horizontal, 2-sided, magnet, custom shapes sizes, and more. You can also create matching letterhead & envelope concepts based on your business card design. Give your cars stunning 3D text effects that really catch people’s attention! Use 3D Text Studio with any fonts to create impressive 3D business cards and more. Easily create matching letterhead and envelopes based on your business card design. Choose a template for any industry or create your own design, millions of possibilities! Hundreds of features for unlimited options!